In the clutch disc hub part, the coupling disk with friction linings and the buffer device. On the connecting disk stamped radial slots. Radial holes reduce stiffness and increase the adhesion friction linings to the buffed surface of the flywheel disk and the friction pressure. Friction lining made partly of asbestos, they are present ventilation groove to improve the heat transfer and clean the surface friction wear products. Cover plates are riveted to the coupling disk. Between the plate and the coupling plate 6 put the plate springs. This design makes the inclusion of softer grip. When the clutch is engaged the spring are flat, in the off state of the disk thickness of 1-1.5 mm larger. Slave drive is interconnected with the hub by means of eight rubber dampers, which are in the nests (slots) conducted disk drives and slots restrictive, which are riveted to the hub. Clutch plate is secured to the hub, which stands on the clutch shaft splines not tough, but with the help of flexible devices, promotes soft clutch engagement, as well as lower dynamic load transmission. Slow down and stop the shaft as well as with disconnection clutch , provided tormozkom. Drive plate tormozka with friction lining is mounted on the shaft by means of splines with the locking ring. Slotted hub slips tormozka moves along a slot on the bracket slips. In turn, the shaft is braked during compression tormozka drives. Forcing bearing able to move along the bracket slips on turning forks and the fork shaft. On the fixed pedal arm. 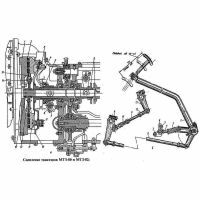 When the pedal is depressed to turn off the clutch, this force is transmitted through the rod and lever straight shaft clutch and pull the trigger lever tormozka. The shaft fork off moves layering, the outlet pressure plate and compresses the spring, so as to free the slave disk. When the pedal is released, the pressure plate with springs moves to its original position, resulting in the clutch engaged.